On November 3, 2004, our foundation forms left North Carolina. 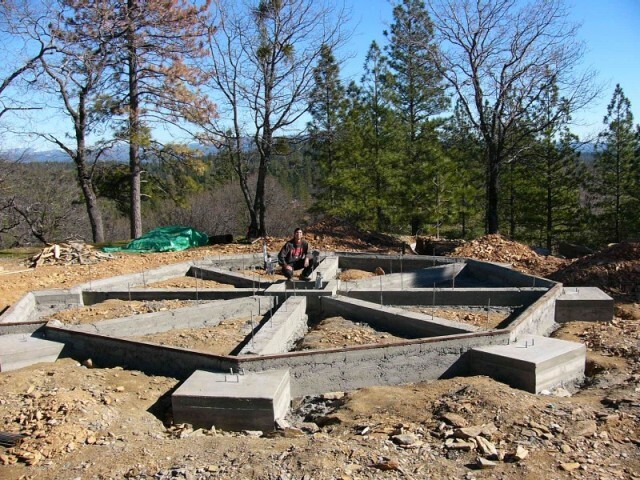 Two shippers would be required to get the huge crate to our mountain top building site in Calaveras, California. Watkins would bring it across the country as far as Sacramento, California. However, a second shipper, Rath, would use a smaller truck to bring it up the winding mountain roads to our property. 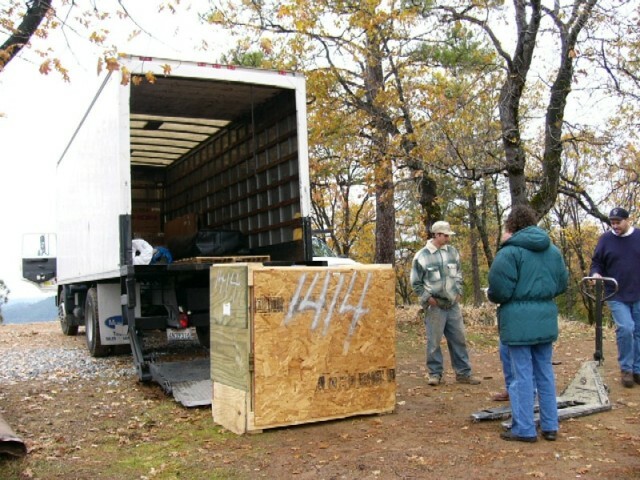 As usual, Gail handled the logistics from this end, staying in contact with both truckers to determine exactly when the crate would arrive. We were glad that we had the extra help, because it took all four men (Russell, Rick, Goliath, and Gary the truck driver) to get the huge crate out of the truck and onto the building site. Gary didn't even want to drive the last hill up to the top, but Russell convinced him that it would be safe. And Gail was very glad that she had told Topsider to hire a truck with a lift -- originally, they weren't going to. 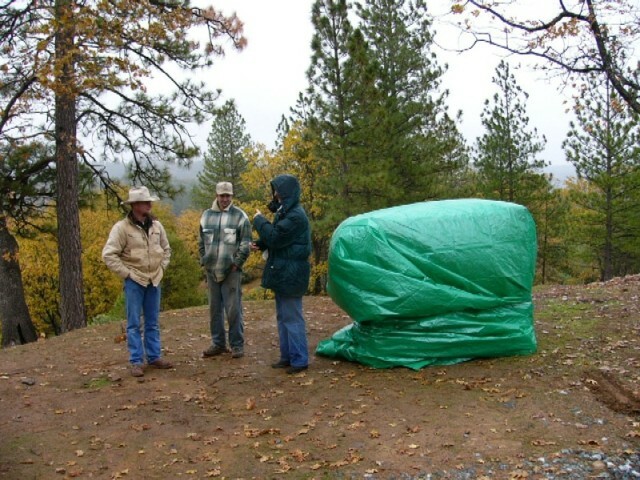 We covered the crate with a tarp that we had brought, left everything in Rick's capable hands, and departed. During the next several months, Rick and his crew took advantage of every non-rainy day to lay out our 30-foot octagonal foundation. There continued to be glitches with Topsider. They had sent the wrong templates for the bolts, so Rick had to make his own from the blueprint specs. Topsider had sent 3/4" bolts and 5/8" nuts, so Rick had to go out and purchase the correct hardware. Additionally, Topsider had sent round washers for the sill plate, but Rick knew that California requires square washers. Rick went ahead and installed the round washers, but he informed us that we would need to change them out before we began building in the Spring. During the holiday season, Gail and Russell also took advantage of non-rainy days, driving two and a half hours just to peek at what was going on. It was an awesome and complicated sight; and we're very glad that we subcontracted this task to someone else. 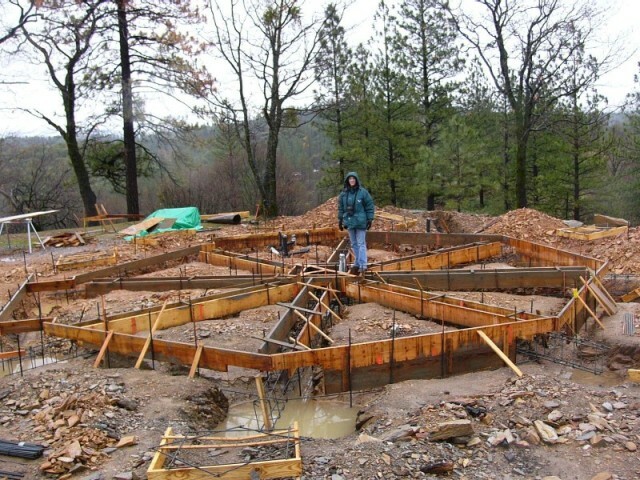 On January 16, 2005, Rick informed us that the laid-out foundation forms had passed inspection, and he could begin pouring the cement piers. And after several rain delays, on February 25 he informed us that the weather had finally cleared enough for him to pour the last of the building pad. 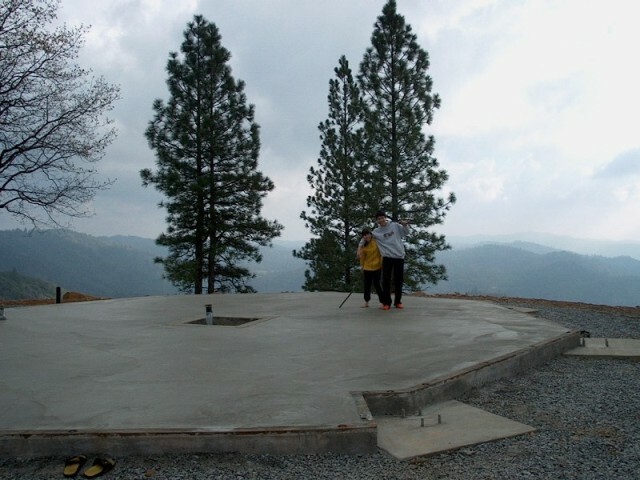 On February 26, we stood on our finished foundation for the first time. As Gail proudly declared, "We have a house!"